With NoGi Jiu-jitsu, leverage and skill are utilized to best size and strength. You'll never feel like an outsider at a Fusion Academy NoGi Jiu-Jitsu class. NoGi Jiu-Jitsu focuses on a clinch-based methodology to increase the effectiveness of grappling when striking is involved, improving it for street and MMA situations. By focusing on clinching, the need to take hold of your opponent’s clothing to control the distance and mitigate the damage is removed, and the NoGi practitioner becomes comfortable moving around, and setting up submissions within this posture that both defends against strikes, and makes it difficult for the opponent to disengage. Black Belt lead instructor and multiple brown belts who have trained in a variety of NoGi grappling, including 10th Planet and Wrestling, bring a fusion of styles to every class. Instructors are high belts and out training with every student, every day. Whether your goals are fitness, self defense, competition, or meeting new people, we’re here to help you succeed. Great instructors and tons of classes to choose from to fit your schedule. I’ve been training there for over 3 years and love it! What a great learning experience! I always pick up little details that really help my technique. Every time I leave Fusion I can’t wait to return. I always look forward to coming to classes at Fusion! Everyone at the studio is welcoming, the space is clean and I always feel safe training; classes are a lot of fun! [At Fusion Academy] you are given everything you need to learn and make Jiu-Jitsu work for you. Detailed instruction, enthusiastic training partners, and a laboratory in which to put what you’ve learned to work safely. I started at Fusion about 3 months ago… I couldn’t say anything nicer about Eddie and all of the guys that train there…. it’s real deal technical BJJ training, with an emphasis on keeping new people safe and un-injured. Welcoming and family friendly atmosphere, but with high level instruction. A great place for every family member (including families of one) to train and get really good at Brazilian Jiu Jitsu. Everyone is always welcoming, and gives feedback on your progress. Many different skill levels are on the mat, so it always exposes you to different things to work on. 7:00 AM – Professor Chris Wells starts class with a warm-up of functional Jiu-Jitsu movements. The class then drills NoGi Jiu-Jitsu techniques and ends with free rolling. At this time new students are invited to continue drilling, or work specific positions. Morning classes have plenty of students, and Chris will make sure that you get specific pointers to improve your technique. 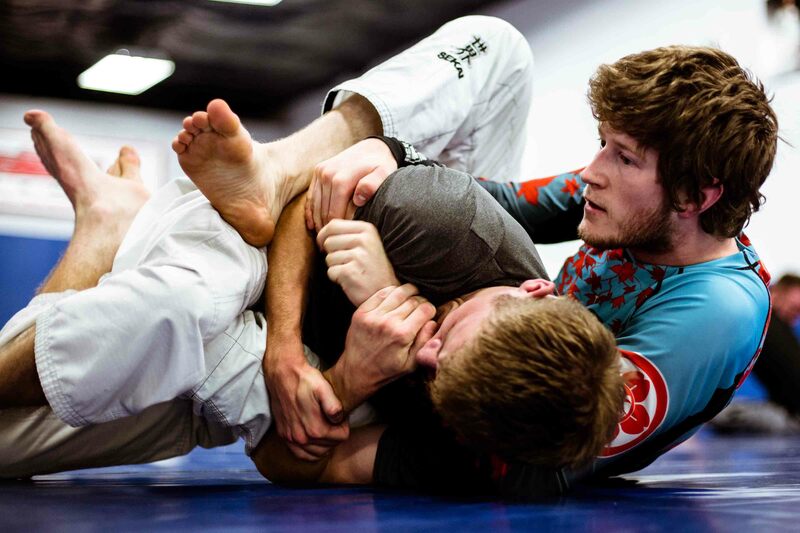 6:00 PM Takedowns – This once a week class with Professor Chris Wells is all about NoGi Takedowns and you’ll learn a variety of methods to get your opponent to the ground. Chris starts class with a warm-up of Jiu-Jitsu movements meant to improve your game when rolling. The class then drills NoGi takedowns, and is followed by another hour of ground based technique training lead by Instructor Shane Brenner, which everyone is invited to stay for. Evening classes have plenty of participants and Chris is great at giving individualized attention to the technical details and key aspects of what the students are practicing that day. 7:00 PM –Instructor Shane Brenner starts with a warm-up focused on improving mobility, both in flexibility and in grappling positions. The class then drills NoGi Jiu-Jitsu techniques and ends with free rolling. At this time new students are invited to continue drilling, or work specific positions. Evening classes have plenty of students, and Shane makes sure that each student grasps the critical aspects of every technique for their skill level. 6:00 AM – Wednesdays see Instructor Clinton Curtis host the first class of a double block of morning NoGi Jiu-Jitsu. Class starts with a functional Jiu-Jitsu and mobility-based warm-up. Then everyone drills NoGi Jiu-Jitsu techniques until ending with free rolling. At this time new students are invited to continue drilling, or work specific positions. Clinton is very detail oriented and makes sure to that even beginners aren’t missing the subtleties that can make or break a technique. 7:00 AM – Professor Chris Wells continues the double block of morning NoGi Jiu-Jitsu. Come to either one you can make it to, or both! 6:00 PM – Professor Chris Wells starts class with a warm-up of functional Jiu-Jitsu movements. The class then drills NoGi Jiu-Jitsu techniques and ends with free rolling. At this time new students are invited to continue drilling, or work specific positions. Evening classes have plenty of students, and Chris makes sure that each student gets the specific pointers they need to improve the techniques being practiced that day. 7:00 AM – Professor Chris Wells starts class with a warm-up of functional Jiu-Jitsu movements. The class then drills NoGi Jiu-Jitsu techniques and ends with free rolling. At this time new students are invited to continue drilling, or work specific positions. Morning classes have plenty of students, and Chris makes sure that each student gets the pointers they need to improve their techniques. 10:30 AM – Instructor Mike Flint starts class with a warm-up designed to increase your positional mobility. The class then drills NoGi Jiu-Jitsu techniques for the full hour. These Saturday classes have plenty of students, and Mike makes sure that you’ll get specific pointers to improve what you’re practicing. Mike is happy to answer any questions about other techniques you may have as well. At the end of the hour, students are invited to stay for open mat and continue drilling, work positions, or join in the open roll depending on skill level.